Every year I set a personal goal for myself, something that I can work on to better my teaching skills and thus better my students. 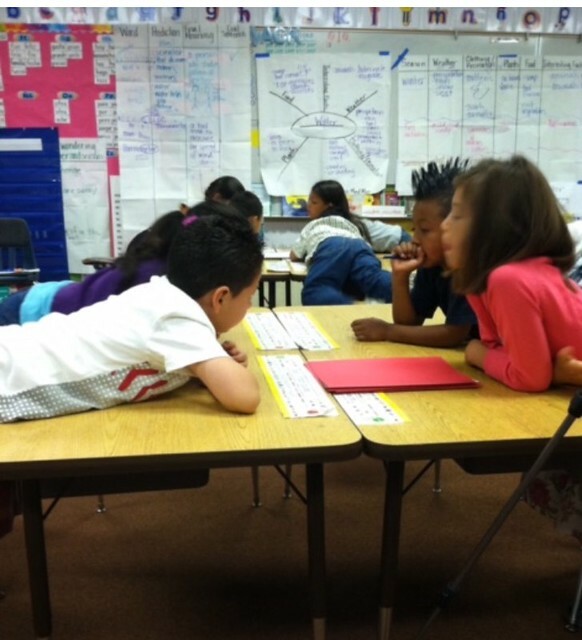 Last year I decided to focus on reaching all students through cooperative learning. I am a 4th grade dual immersion teacher. What that means is that I teach all Common Core Standards in two languages. Half of my day I teach these standards in English, and the other half I teach them in Spanish. 50% of my students are English learners, and the other 50% are Spanish learners whose primary language is English. That means that at any time during the day, whether it be Science, Math, Language Arts, or any other subject, half of my students are learning in their 2nd language. So return with me to the first day of the last school year. I’m all ready and excited to begin working on my goal of reaching all students. I began my day in English and I had normal first day participation. Most students walked in very shy and weren’t ready to show me their true colors yet. I noticed this boy David*. He was not shy, rather the opposite, ready to participate, a firecracker actually with lots of energy and drive. But what I noticed most was his award winning smile. Then came the time to switch to the Spanish language. Remember, I also teach Common Core Standards in Spanish half the day. David’s whole demeanor changed when the class began speaking in Spanish. He did not want to participate and he completely shut down. This happened every day. I’m sure you all have students like this in your class. If you teach Science, you may have those students who show no interest. Or maybe if you’re a math teacher you’ve seen the students who have been unsuccessful in the past so they come to your class already defeated and unwilling to try. Many of these “unreachables” become our behavior problems. Of course, educating in California, we all have a good number of English Language Learners. No matter what the subject matter we teach, or the assignment we hold in the education field, I think we can all relate to our desire to want to reach all students and the struggles we encounter as we try. So I focused on reaching David. I wanted to make sure he felt seen and important in the classroom. I called on him, often. He of course never raised his hand. Those raising their hands were the students who didn’t need my attention. You know the students, the extroverts, “I know the answer!” The native language speakers, “I know how to say the answer!” And the high achievers, “The answer is so easy!” But when I called on David, he shut down even more! I could see it in his eyes, like a deer caught in headlights. His stress level increased exponentially and made it impossible for him to focus and have success. I tried to ensure that he had easy access to the information. I made graphic organizers, used manipulatives and realia. I held 10:2 discussions where I talked for ten minutes, and then let the students talk among themselves for two minutes to process the information. After the student discussions I would call on David, really trying to give him a question that would bring definite success for him, but I always got the same result. He would not participate, or even try, he acted as if he were defeated, and that winning smile of his never appeared during Spanish time. I realized that I had to research Cooperative Learning strategies quickly if I was going to be able to reach him before his grades and self-esteem plummeted. So I read articles and books, I attended conferences, I observed other teachers. And then I had a realization! I was teaching Cooperative Learning all wrong! First of all, I found that you must strategically plan for diverse grouping. Diverse grouping, it’s all over the Common Core Standards. I initially thought, “Easy, I group students all the time. Their desks are grouped in pods of four and I encourage communication and group tasks daily”. But I learned that is not diverse grouping. I needed to really plan and think about my students. I had to analyze every one of them and decide where they fit best in the classroom. Who were my language learners? My high and low achievers? My extroverts and introverts? Who were possible behavior issues? Who were Friends? Who were enemies? What ethnic and cultural groups were represented in my class? Gifted? Special Education Students? And after analyzing everyone, I had to strategically place them in groups that were the most beneficial for every student. I needed truly diverse groups. Next I had to look at time equity. Did I really give everyone equal time to share and practice the language and standard orally? Well, when I asked a question and looked for raised hands, this was definitely not equitable. Again, only the extroverts, “I know the answer!” The native language speakers, “I know how to say the answer!” The high achievers, “The answer is so easy!” were participating. This was not equitable. Then I thought about the 10:2 discussions and thought, “No, the same student populations are still dominating the conversations.” What about random cold calling… No, David would freeze up if his name were called. No my time equity was horrible!! Luckily, I learned a new strategy to ensure that I was reaching ALL students. I assigned seat partners letters, seated side by side– letter A and letter B. I taught my lesson, for example, lecturing on Rain Forest ecosystems for 10 minutes and then instead of asking for a volunteer or cold calling, or telling students to discuss in groups I said instead, “Partner A, talk to Partner B for 30 seconds about Rain Forests.” After 30 seconds, Partner B would give praise such as, “ I really like what you said about …” and then paraphrase what his partner had said. This ensures that he is actively listening while his partner shares. Then the roles are reversed and Partner B will share. The whole class responds in this manner, thus reaching ALL Students. Now I know you’re probably thinking about David, or maybe your own hard to reach students, and you ask, “What about them? What happens to someone like David, who can’t yet form a sentence about the topic, let alone speak for 30 seconds. Well that’s when planning for diverse grouping comes in. I had seated David next to a very patient student who was trained to encourage him to elaborate so he could access his 30 second time slot. If David responded to the rain forest question with, “I like rainforests.” Then his partner would ask, “Do you like rain?” Or “What types of rainforest animals do you like?” Thus David gets his time to practice the subject and language, while his partner gets to model and teach, which is also proven to be great for the brain and cognitive development. It’s a win, win situation! Lastly, I learned to truly make this type of cooperative classroom work, I needed to team build. I needed to create opportunities for these students to find similarities and respect for each other so they would be willing to help those in need. I planned short fun, non-academic activities for them. For example, in a group of four, I would ask, “What is your favorite ice cream flavor?” Imagine that one student responded, “Chocolate”. And another said, “Vanilla”. And then the remaining two said strawberry and chocolate. Well, now we just built a bridge. They know that two members of their group like chocolate and they begin to see similarities, rather than differences. You can also ask a more open ended question like, “What is your dream house?” Give them each 30 seconds to share, time equity, and again, you have built another bridge. Also for teambuilding I like to do dance activities. Everyone in the class stands, I put on fun music, and a chosen member of each team dances in front of their own teammates, crazily most likely, while her team mirrors or mimics her. If you look out at the whole class, you see 8 groups of four students dancing different dances together. The whole team has fun being silly and dancing with each other. If you take the time to encourage them to have fun together, they will be more likely to want to work together in the future. So it’s the end of the year and I received this letter from David. You’re personally my best teacher because you motivate me to learn as much Spanish as I can, and also thank you for everything you taught me. Also you are really fun because you play music and do activities with us. I’m happy to tell you that David was reached this year! By mid-year, he was fully participating in all classroom activities- no matter the subject or language. His self-esteem had skyrocketed and his famous smile had returned. With help from his strategically placed table partners, he learned the vocabulary and grammar necessary to voice his opinions. He was able to access Common Core Standards in his second language. And more importantly, by placing him in a safe environment created by teambuilding activities, he was able to learn that mistakes are good, and something to be learned from. He did not have the fear of failure anymore. And I know David wasn’t the only one who benefited from the application of true Cooperative Learning Strategies. By not letting my students raise their hands to answer questions, but rather direct them to partner or group discussions allowing for time equity, all students were reached at their own differentiated level. All students were teachers and models for others. All students were pushed to a higher level of thinking due to peer interaction and the processing of new information. And all students had a safe environment to practice and learn. As you this new year, I want to encourage you to plan how you will reach all students. I hope that you will rethink the common practice of cold calling or asking students to raise their hands to respond. Imagine the change we could bring about if we multiplied all of you reading today’s blog on Multilingual Mania, and we multiplied that number by the amount of students we teach, and we were able to reach every single one of them! Let’s do some miraculous things in our classrooms! Come on, educators of the future generation! Encourage your students to stop raising their hands and instead actively communicate with each other! About the Author: Krista Richardson is a fourth grade dual immersion teacher in a Southern California school district. She is also a Common Core Demonstration Teacher who models lessons to teachers who want to learn more about Common Core strategies. She can also be found blogging on Lovin Common Core. *David is not the name of a real student. The David in this story is a composite of a number of Spanish learner students.